Sunday's Super Bowl between the Patriots and Rams is your last chance to fill out a daily fantasy football lineup until September. You aren't gonna miss out, are you? Sunday's Super Bowl between the Patriots and Rams is your last chance to fill out a daily fantasy football lineup until September. You aren't gonna miss out, are you? I've done these lineups periodically throughout the regular season, and [the conference championship games](https://www.betchicago.com/nfl-conference-championship-draftkings-lineup) were my first attempt in the playoffs. It was a decent one, with 111.26 points, including the week's leading rusher Sony Michel. Here are my results from this season: Week 2, 160; Week 3, 166.2; Week 4, 130.5; Week 5, 133.5; Week 6, 143.6; Week 7, 114; Week 8, 147.5; Week 9, 114.64; Week 10, 139.4; Week 15, 97.42; Week 17, 90.34; Conference championships, 111.26. Since there's only one game Sunday, the only mode available on DraftKings is Showdown Captain Mode. The way it works is you pick one player as your designated captain, who earns "1.5x the standard fantasy point value for each statistic," according to [the DK website](https://www.draftkings.com/help/rules/1/96), and then five flex players (all positions included). [Standard $50K budget](https://www.draftkings.com/draft/lineup/create/23985), but the captains cost 1.5x more than they otherwise would because of their bolstered points. 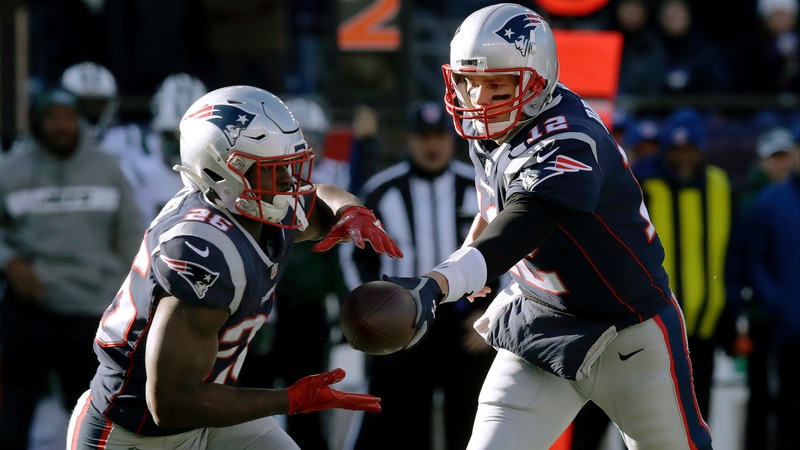 __MORE:__ [Complete Super Bowl 53 coverage](https://www.betchicago.com/nfl-betting) ## Super Bowl 53 DraftKings lineup __Captain: Sony Michel, Patriots ($10,200)__ -- He has the best shot at scoring multiple touchdowns, since he has five in two playoff games. He also has 242 rushing yards on 53 carries (4.6 per attempt), and the Rams really can't completely take him away, because Tom Brady can just throw swing passes out of the backfield to James White, crossing routes to Julian Edelman or hit Rob Gronkowski down the seam. (In case you haven't realized, I think New England will cruise in the game.) __MORE:__ [Value MVP plays](https://www.betchicago.com/rob-gronkowski-super-bowl-mvp-bets-patriots-rams) __FLEX1: Tom Brady, Patriots ($10,600)__ -- Feel like I have to take advantage of putting a quarterback in a flex position, and Brady has thrown for at least 340 yards in each of New England's two playoff games. He should've had three interceptions in the AFC Championship Game against the Chiefs (and if he did, New England wouldn't even be here), which is the only reason he's not my captain. Still, expect him to be on point indoors (both playoff games were in cold weather). <a href="https://www.youtube.com/watch?v=DiXh8H6dozk" class="embedly-card" data-card-width="100%" data-card-controls="0">Embedded content: https://www.youtube.com/watch?v=DiXh8H6dozk</a> __FLEX2: Jared Goff, Rams ($10,000)__ -- If you have the budget for two quarterbacks, why not take both? Goff struggled against the Cowboys (only 8.6 fantasy points), but was much better last week in New Orlenas (15.9), and Los Angeles will have to sling it to stay in the game. __FLEX3: Robert Woods, Rams ($7,800)__ -- When Goff needs to sling it, Woods is the guy who he looks to most. Brandin Cooks has been the more productive Los Angeles receiver in the playoffs, but Woods has been targeted 18 times in the two games as opposed to 14 for Cooks. Woods has only 102 yards on 12 catches, but if he can just break one for a big gain, he'll be worth this spot. __FLEX4: James White, Patriots ($7,200)__ -- Gotta take the PPR machine himself, who has 19 catches for 146 yards in the playoffs. Edelman has 16 receptions for 247 yards in the playoffs, but is $3,600 more, so even though the receiver should have another strong game, it's White who gets the nod. __FLEX5: Phillip Dorsett, Patriots ($4,200)__ -- Pretty cheap for a player who has scored three straight weeks. He's got five catches for 70 yards and two touchdowns in the playoffs, and he's been targeted eight times, so he's moved into the role of the No. 2 receiver vacated by Josh Gordon. Not as talented, but that's just fine for our purposes. __PLAY:__ Our free [$10K Big Game Blitz](https://betchicago.chalkline.com/games/10k-big-game-blitz). Correctly answer eight prop questions for Sunday's game to win a piece (or all) of the cash).